Another transition for Elton, and this one worked out very well to his advantage. Although this is a fine work, it's not being reviewed by myself so much for quality as it is quantity. The original songs are all collaborations by Elton and Tim Rice (they wrote one song together, Legal Boys from Jump Up!) many years ago. As with many soundtracks, there are several pieces featured that make up the musical score of the movie, this one done by Hans Zimmer. So what we are left with are actually only five original songs, although three are done by movie characters and then repeated by Elton. It must be said that these five are excellent pieces, however. Two of these, everyone knows by now, Circle of Life and Can You Feel the Love Tonight and the other which Elton sings, I Just Can't Wait To Be King is a more up tempo song that deserves mentioning as well. The two songs not sung, but written by John/Rice, Be Prepared and Hakuna Matata were probably deemed a little too story oriented for Elton to make his "own" songs. This album was very unique for several reasons. Much to his pleasure, a whole new generation of (very) young listeners came to appreciate Elton as "The Lion King Guy". 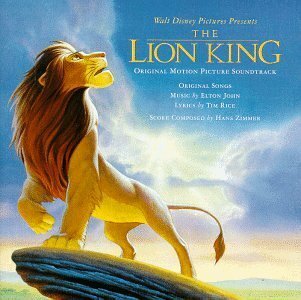 At the time, the movie became Disney's most successful movie ever and began a trend to (try to) incorporate big names to do the music for future films. One can not look at the success of this film and not heap much of the credit towards Elton.